This morning in Washington DC, federal and Los Angeles officials joined together to announce full funding for the initial phase extending Metro’s Purple Line Subway. This funding had been hinted at earlier, but today it’s a done deal. Barring any kind of governmental shutdown. Metro will receive $1.35 billion in federal grant funding, plus another $0.86 billion in federal infrastructure loans. Today’s $2 billion completes the $2.8 billion budget for extending the subway 3.9 miles west underneath Wilshire Boulevard, to a terminus at Wilshire and La Cienega. Construction is anticipated to start this summer and be completed in 2023. With the project ready to begin construction, hopefully truth-challenged editorials and confusing campaign talk of a “third way” alternative route will soon be a thing of the past. No speculation on how the funding announcement timing dovetails with Metro’s planned fare increases. Lots of additional local coverage at: Santa Monica Next, Long Beachize, KPCC, The Source, Daily News, LA Register, and the LA Times. This is great. But it’s just so frustrating that it takes nearly a decade to build a 3 stop subway extension in the US. This is on par with NYC’s 2nd Ave, phase 1 which is also 3 stops, although somewhat shorter in overall length. The station should be in the northbound direction, that way the line can travel to the VA via West Hollywood in order to satisfy their needs for rail. The stations should include: the Beverly Center/Cedar Sinai, West Hollywood/Pacific Design Center, Beverly Hills Civic Center and Century City of course. Does anyone know if there is any potential way to speed up this process? Is the length because of funding issues or because that is actually how long this project takes to construct? There’s no more funding needed – I think it just takes time to tunnel and build. Sometimes (like with the Regional Connector) the contractor can do it slightly faster than expected… but sometimes there are delays, too. This is just how long it takes to construct a subway in a linear fashion in a developed urban landscape. The only way to speed up is to construct the line in non-linear fashion… meaning concurrent work on different parts of the line. The EIR for this project did study the impact for concurrent construction of all three phases (i.e start digging at Wilshire/Western, Wilshire/La Cienega and Century City at the same time) so we can do that, but we don’t have the money. We had to fight hard just to secure Federal funding for phase 1 (Western to La Cienega). If we had passed Measure J a few years ago to extend the sales tax by another 30 years, we could have borrowed enough money (and perhaps get even more Federal funding as a result too) to start phase 1 and phase 2 together. I think the plans are to extend the Crenshaw Line some day up to Crenshaw and Venice, and then to detour along Venice and San Vicente up to West Hollywood, and eventually loop back to Hollywood and Highland. Beverly Hills Civic Center would still be missing out, but otherwise this gets all the places you mention. I know that is the plan, but I feel Metro could reserve towards consolidating the plan into one whole line, the map I made is pretty much my proposal that Metro could still possibly adopt, there would be 3 parties that would be satisfied, 1. Beverly Hills: The subway wouldn’t touch the boundaries of it’s high school. 2. 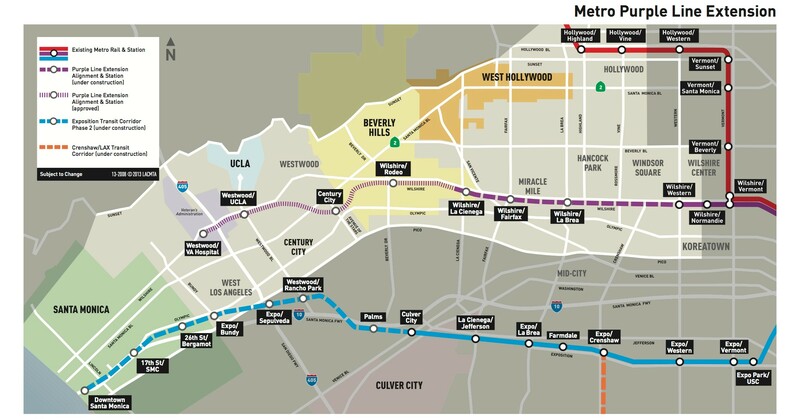 Metro: Guarantee Subway service to Beverly Hills, 3. West Hollywood: Being able to take the subway from WH to downtown in 20 minutes is much more ideal. The important aspect of these projects is to ensure that they are cost effective as possible. This is so exciting. I’m really looking forward to getting around more quickly in the next decade. This 1970s are going to be to so exciting. I’m grateful the funding for phase 1 in now in place but man…9 years? That’s a painfully long time to extend the line just 3 additional stops. Constructing a deep-bore subway is a massive effort. I was lucky to be part of a group that toured the Universal City station when it was under construction. We even walked a short distance into the unlined tunnel. Just the scale of it all is what I still remember — HUGE. To state it is “just 3 additional stops” really doesn’t show any understanding of what this massive project calls for — not just in money but engineering and earth moving. My understanding is if Measure J passed all three phases could have been ready to open by 2023. What timing would result if a 2016 measure passed is likely not going to be quite so robust. Some of us contemplate that a 405 project would necessarily leverage the movement to convert the Orange Line to light rail so we would create a giant rail link of the Valley to the westside (maybe as far as LAX?). An alliance of labor, business, stakeholders, etc. has been quietly working on building support for a 405 rail project. To stop and re-do the plans at this late date would entail a multi-year delay while studies, EIRs, engineering, etc. had to be done. This also would be more costly, curves add complications and it really wouldn’t result in all that much additional ridership versus the current alignment. I bet it wouldn’t compete well for federal funds. I suggest it is better to invest your aspirations for this with the eventual Crenshaw northern extension. Wilshire Boulevard is currently closed just west of Western Avenue - for Purple Line subway construction. Phase 2 breaks ground tomorrow.